Zinc is an essential nutrient required by humans and animals alike. It plays a variety of biological roles in the body and helps support and maintain healthy skin, hair, nails and the immune system. True Food® Zinc has been bio-transformed by a culture of Saccharomyces cerevisiae to a true food form, for easy absorption and optimum function. It also provides true food copper in the correct ratio to zinc. Proprietary mixture: zinc sulphate, copper sulphate with enzyme digested Saccharomyces cerevisiae (with soya); anti-caking agents: stearic acid*, magnesium stearate*, silicon dioxide; bulking agent: microcrystalline cellulose; bulking agent: hydroxypropyl cellulose; coating: methylcellulose, glycerine, natural vanilla flavour (agave syrup; flavour: vanilla extract; colour: caramel). Adults take 1 tablet a day, with or between meals (children over 8 years take 1 tablet on alternate days), or as your health professional advises. 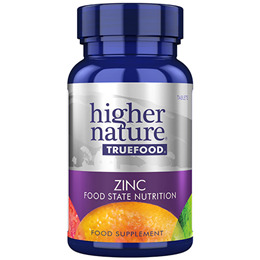 Higher Nature True Food Zinc can be taken while breastfeeding. Below are reviews of True Food Zinc - 90 Tablets by bodykind customers. If you have tried this product we'd love to hear what you think so please leave a review. Question about True Food Zinc - 90 Tablets Are the True Food supplements suitable for those with an intolerance to yeast? 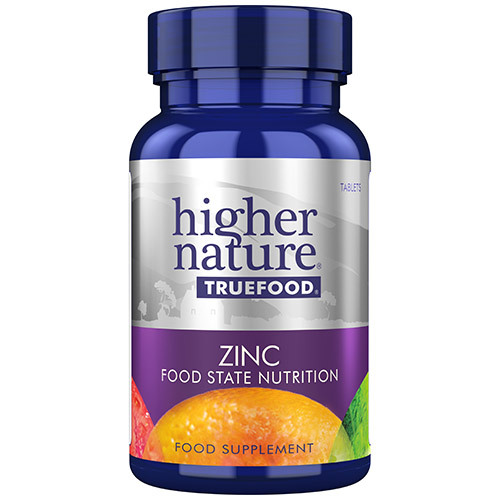 Question about True Food Zinc - 90 Tablets Are the nutrients in the True Food range synthetic?